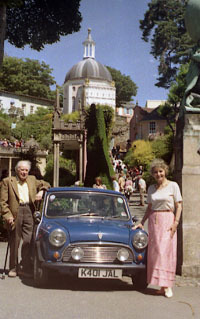 On July 13th 2008, PM2008, The Official one-day Celebration of Patrick McGoohan, The Prisoner, Danger Man, and Portmeirion took place in the Hercules Hall, and for the fourth year running the event was a popular success and a full photo report of the event is now online HERE. Special guests Robert Rietti, Bettine Le Beau, Rob Fairclough, and Bob Fischer kept the audience captivated, no less than 4 special screenings were shown on the big screen, and an auction, raffle, guided tour, displays, and competitions kept the large crowd entertained. The event, organised by Rick Davy of TUW and Dave Jones, was in aid of Ty Gobaith Children's Hospice and over £500 profit was made on the day.